The Hall family country home, Oak Hall, was located five miles north of the village of Tivoli, New York. After the death of her parents, Eleanor was surrounded by aunts and uncles at Tivoli, who encouraged her to ride her pony, play tennis, and ride a bicycle. Immersed in a female-dominated world (consisting of her grandmother, aunts, and their friends) where she was for the first time in her life a primary focus of attention, ER's time at Tivoli gave her "a sense of belonging, place, and purpose." 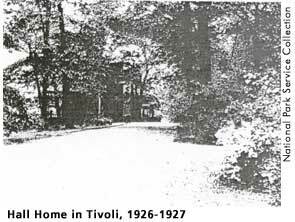 (1) At first Grandmother Hall refused to send ER away to boarding school in Europe, as her mother had wished, but by 1899, Tivoli had no longer become a calm pastoral retreat for a young woman. ER's young uncles, Eddie and Valentine, became ever more unpredictable as their drinking increased. After returning from Allenswood, ER again resided at the Hall family homes, including the Tivoli estate, until her marriage to FDR. Blanche Wiesen Cook, Eleanor Roosevelt: Volume One, 1884-1933 (New York: Viking Press, 1992), 95. Cook, Blanche Wiesen. Eleanor Roosevelt: Volume One, 1884-1933. New York: Viking Press, 1992, 94-95, 100-101.